In subsonic aerodynamics, the theory of lift is based upon the forces generated on a body and a moving gas (air) in which it is immersed. At speeds of approximately 260 knots or less, air can be considered incompressible in that, at a fixed altitude, its density remains nearly constant while its pressure varies. Under this assumption, air acts the same as water and is classified as a fluid. 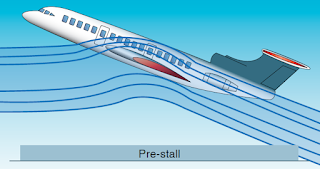 Subsonic aerodynamic theory also assumes the effects of viscosity (the property of a fluid that tends to prevent motion of one part of the fluid with respect to another) are negligible and classifies air as an ideal fluid conforming to the principles of ideal-fluid aerodynamics such as continuity, Bernoulli’s principle, and circulation. In reality, air is compressible and viscous. While the effects of these properties are negligible at low speeds, compressibility effects in particular become increasingly important as speed increases. Compressibility (and to a lesser extent viscosity) is of paramount importance at speeds approaching the speed of sound. In these speed ranges, compressibility causes a change in the density of the air around an aircraft. While flights in the transonic and supersonic ranges are common occurrences for military aircraft, civilian jet aircraft normally operate in a cruise speed range of Mach 0.7 to Mach 0.90. VMO/MMO is defined as the maximum operating limit speed. VMO is expressed in knots calibrated airspeed (KCAS), while MMO is expressed in Mach number. The VMO limit is usually associated with operations at lower altitudes and deals with structural loads and flutter. The MMO limit is associated with operations at higher altitudes and is usually more concerned with compressibility effects and flutter. At lower altitudes, structural loads and flutter are of concern; at higher altitudes, compressibility effects and flutter are of concern. Adherence to these speeds prevents structural problems due to dynamic pressure or flutter, degradation in aircraft control response due to compressibility effects (e.g., Mach Tuck, aileron reversal, or buzz), and separated airflow due to shock waves resulting in loss of lift or vibration and buffet. Any of these phenomena could prevent the pilot from being able to adequately control the aircraft. For example, an early civilian jet aircraft had a VMO limit of 306 KCAS up to approximately FL 310 (on a standard day). At this altitude (FL 310), an MMO of 0.82 was approximately equal to 306 KCAS. Above this altitude, an MMO of 0.82 always equaled a KCAS less than 306 KCAS and, thus, became the operating limit as you could not reach the VMO limit without first reaching the MMO limit. For example, at FL 380, an MMO of 0.82 is equal to 261 KCAS. It is important to understand how airspeed varies with Mach number. As an example, consider how the stall speed of a jet transport aircraft varies with an increase in altitude. The increase in altitude results in a corresponding drop in air density and outside temperature. Suppose this jet transport is in the clean configuration (gear and flaps up) and weighs 550,000 pounds. 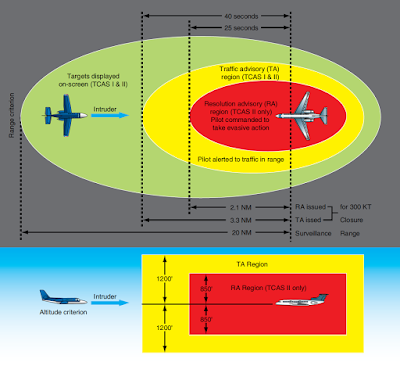 The aircraft might stall at approximately 152 KCAS at sea level. This is equal to (on a standard day) a true velocity of 152 KTAS and a Mach number of 0.23. At FL 380, the aircraft will still stall at approximately 152 KCAS, but the true velocity is about 287 KTAS with a Mach number of 0.50. Although the stalling speed has remained the same for our purposes, both the Mach number and TAS have increased. With increasing altitude, the air density has decreased; this requires a faster true airspeed in order to have the same pressure sensed by the pitot tube for the same KCAS, or KIAS (for our purposes, KCAS and KIAS are relatively close to each other). The dynamic pressure the wing experiences at FL 380 at 287 KTAS is the same as at sea level at 152 KTAS. However, it is flying at higher Mach number. Another factor to consider is the speed of sound. A decrease in temperature in a gas results in a decrease in the speed of sound. Thus, as the aircraft climbs in altitude with outside temperature dropping, the speed of sound is dropping. At sea level, the speed of sound is approximately 661 KCAS, while at FL 380 it is 574 KCAS. Thus, for our jet transport aircraft, the stall speed (in KTAS) has gone from 152 at sea level to 287 at FL 380. Simultaneously, the speed of sound (in KCAS) has decreased from 661 to 574 and the Mach number has increased from 0.23 (152 KTAS divided by 661 KTAS) to 0.50 (287 KTAS divided by 574 KTAS). All the while, the KCAS for stall has remained constant at 152. This describes what happens when the aircraft is at a constant KCAS with increasing altitude, but what happens when the pilot keeps Mach constant during the climb? In normal jet flight operations, the climb is at 250 KIAS (or higher (e.g. heavy)) to 10,000 feet and then at a specified en route climb airspeed (about 330 if a DC10) until reaching an altitude in the “mid-twenties” where the pilot then climbs at a constant Mach number to cruise altitude. Assuming for illustration purposes that the pilot climbs at a MMO of 0.82 from sea level up to FL 380. KCAS goes from 543 to 261. The KIAS at each altitude would follow the same behavior and just differ by a few knots. The speed of sound is decreasing with the drop in temperature as the aircraft climbs. The Mach number is simply the ratio of the true airspeed to the speed of sound at flight conditions. The significance of this is that at a constant Mach number climb, the KCAS (and KTAS or KIAS as well) is falling off. The viscous nature of airflow reduces the local velocities on a surface and is responsible for skin friction. As discussed earlier, the layer of air over the wing’s surface that is slowed down or stopped by viscosity is the boundary layer. There are two different types of boundary layer flow: laminar and turbulent. The laminar boundary layer is a very smooth flow, while the turbulent boundary layer contains swirls or eddies. The laminar flow creates less skin friction drag than the turbulent flow but is less stable. 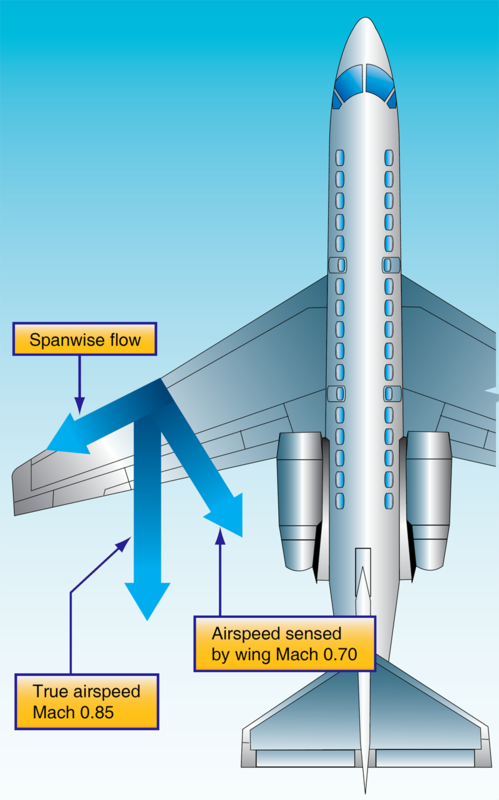 Boundary layer flow over a wing surface begins as a smooth laminar flow. As the flow continues back from the leading edge, the laminar boundary layer increases in thickness. At some distance back from the leading edge, the smooth laminar flow breaks down and transitions to a turbulent flow. From a drag standpoint, it is advisable to have the transition from laminar to turbulent flow as far aft on the wing as possible or have a large amount of the wing surface within the laminar portion of the boundary layer. The low energy laminar flow, however, tends to break down more suddenly than the turbulent layer. When an airplane flies at subsonic speeds, the air ahead is “warned” of the airplane’s coming by a pressure change transmitted ahead of the airplane at the speed of sound. Because of this warning, the air begins to move aside before the airplane arrives and is prepared to let it pass easily. When the airplane’s speed reaches the speed of sound, the pressure change can no longer warn the air ahead because the airplane is keeping up with its own pressure waves. Rather, the air particles pile up in front of the airplane causing a sharp decrease in the flow velocity directly in front of the airplane with a corresponding increase in air pressure and density. 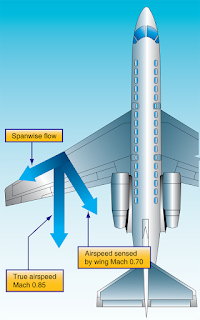 As the airplane’s speed increases beyond the speed of sound, the pressure and density of the compressed air ahead of it increase, the area of compression extending some distance ahead of the airplane. At some point in the airstream, the air particles are completely undisturbed, having had no advanced warning of the airplane’s approach, and in the next instant the same air particles are forced to undergo sudden and drastic changes in temperature, pressure, density, and velocity. The boundary between the undisturbed air and the region of compressed air is called a shock or “compression” wave. This same type of wave is formed whenever a supersonic airstream is slowed to subsonic without a change in direction, such as when the airstream is accelerated to sonic speed over the cambered portion of a wing, and then decelerated to subsonic speed as the area of maximum camber is passed. 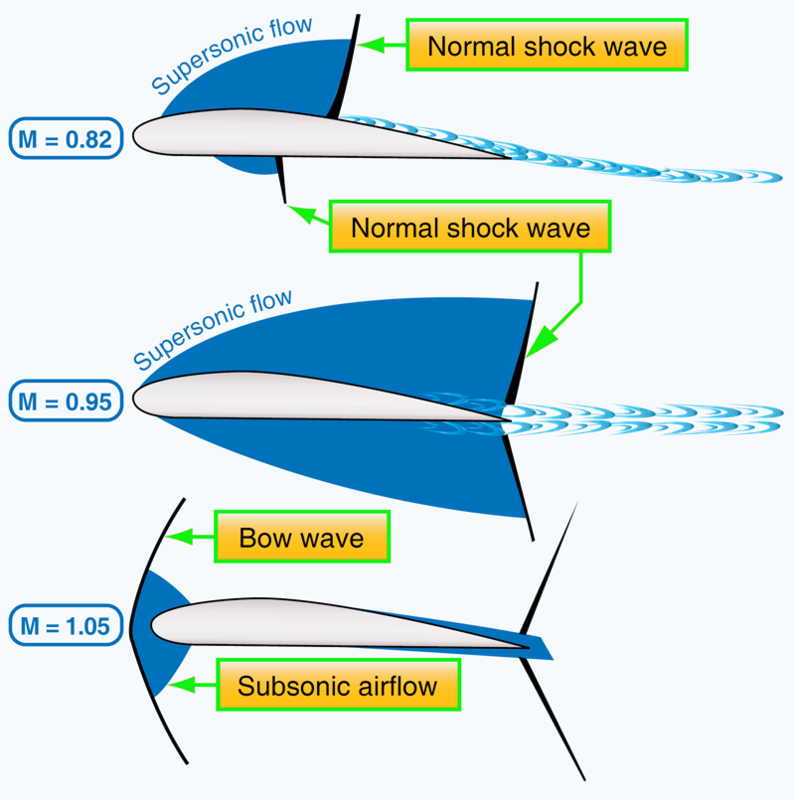 A shock wave forms as a boundary between the supersonic and subsonic ranges. The airstream is slowed to subsonic. The airflow immediately behind the shock wave does not change direction. The static pressure and density of the airstream behind the wave is greatly increased. The energy of the airstream (indicated by total pressure—dynamic plus static) is greatly reduced. Shock wave formation causes an increase in drag. One of the principal effects of a shock wave is the formation of a dense high pressure region immediately behind the wave. The instability of the high pressure region, and the fact that part of the velocity energy of the airstream is converted to heat as it flows through the wave, is a contributing factor in the drag increase, but the drag resulting from airflow separation is much greater. If the shock wave is strong, the boundary layer may not have sufficient kinetic energy to withstand airflow separation. The drag incurred in the transonic region due to shock wave formation and airflow separation is known as “wave drag.” When speed exceeds the critical Mach number by about 10 percent, wave drag increases sharply. 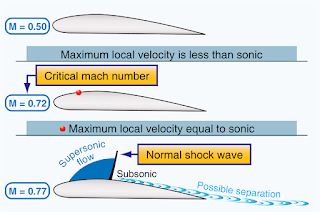 A considerable increase in thrust (power) is required to increase flight speed beyond this point into the supersonic range where, depending on the airfoil shape and the AOA, the boundary layer may reattach. Associated with “drag rise” are buffet (known as Mach buffet), trim, and stability changes and a decrease in control force effectiveness. 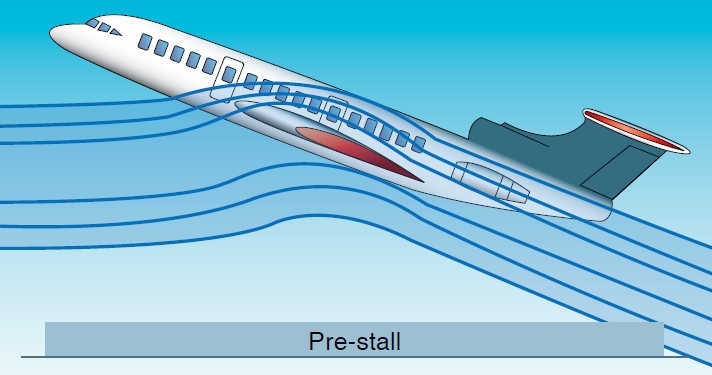 The loss of lift due to airflow separation results in a loss of downwash and a change in the position of the center pressure on the wing. Airflow separation produces a turbulent wake behind the wing, which causes the tail surfaces to buffet (vibrate). The nose-up and nose-down pitch control provided by the horizontal tail is dependent on the downwash behind the wing. Thus, an increase in downwash decreases the horizontal tail’s pitch control effectiveness since it effectively increases the AOA that the tail surface is seeing. Movement of the wing CP affects the wing pitching moment. If the CP moves aft, a diving moment referred to as “Mach tuck” or “tuck under” is produced, and if it moves forward, a nose-up moment is produced. This is the primary reason for the development of the T-tail configuration on many turbine-powered aircraft, which places the horizontal stabilizer as far as practical from the turbulence of the wings. On a straight wing aircraft, the airflow strikes the wing leading edge at 90°, and its full impact produces pressure and lift. A wing with sweepback is struck by the same airflow at an angle smaller than 90°. This airflow on the swept wing has the effect of persuading the wing into believing that it is flying slower than it really is; thus the formation of shock waves is delayed. 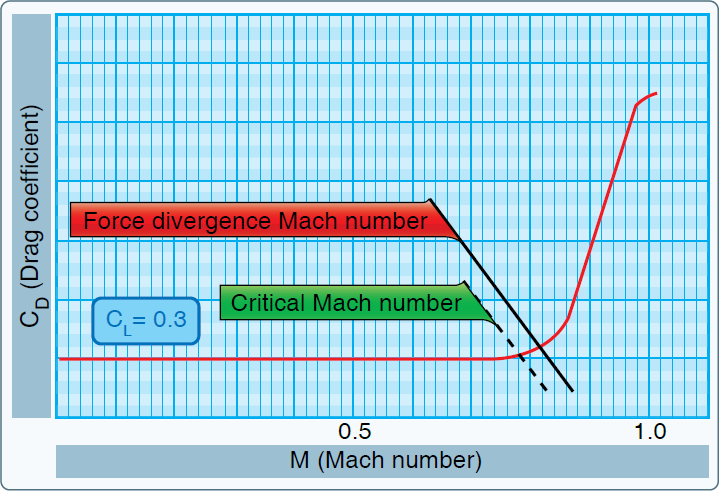 Advantages of wing sweep include an increase in critical Mach number, force divergence Mach number, and the Mach number at which drag rise peaks. In other words, sweep delays the onset of compressibility effects. 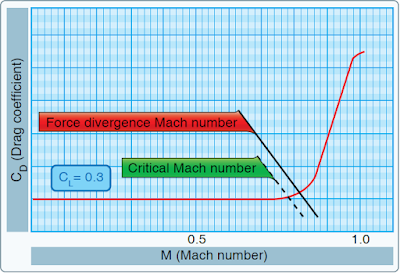 The Mach number that produces a sharp change in coefficient of drag is termed the “force divergence” Mach number and, for most airfoils, usually exceeds the critical Mach number by 5 to 10 percent. At this speed, the airflow separation induced by shock wave formation can create significant variations in the drag, lift, or pitching moment coefficients. In addition to the delay of the onset of compressibility effects, sweepback reduces the magnitude in the changes of drag, lift, or moment coefficients. In other words, the use of sweepback “softens” the force divergence. A disadvantage of swept wings is that they tend to stall at the wingtips rather than at the wing roots. [Figure 6] This is because the boundary layer tends to flow spanwise toward the tips and to separate near the leading edges. Because the tips of a swept wing are on the aft part of the wing (behind the CL), a wingtip stall causes the CL to move forward on the wing, forcing the nose to rise further. The tendency for tip stall is greatest when wing sweep and taper are combined. 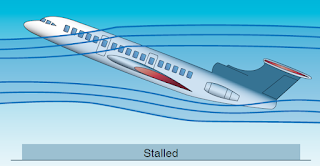 The stall situation can be aggravated by a T-tail configuration, which affords little or no pre-stall warning in the form of tail control surface buffet. 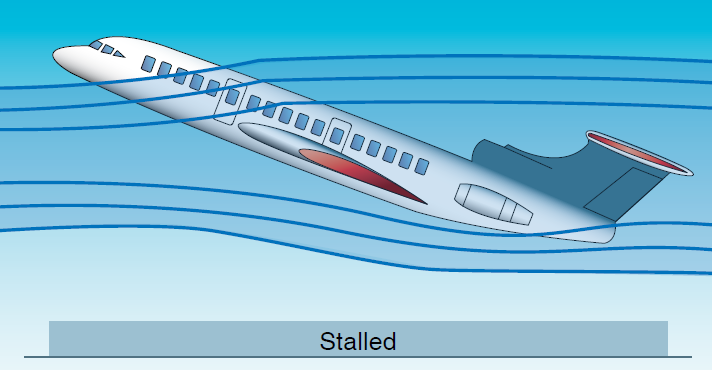 [Figure 7] The T-tail, being above the wing wake remains effective even after the wing has begun to stall, allowing the pilot to inadvertently drive the wing into a deeper stall at a much greater AOA. If the horizontal tail surfaces then become buried in the wing’s wake, the elevator may lose all effectiveness, making it impossible to reduce pitch attitude and break the stall. In the pre-stall and immediate post-stall regimes, the lift/drag qualities of a swept wing aircraft (specifically the enormous increase in drag at low speeds) can cause an increasingly descending flight path with no change in pitch attitude, further increasing the AOA. In this situation, without reliable AOA information, a nose-down pitch attitude with an increasing airspeed is no guarantee that recovery has been affected, and up-elevator movement at this stage may merely keep the aircraft stalled. It is a characteristic of T-tail aircraft to pitch up viciously when stalled in extreme nose-high attitudes, making recovery difficult or violent. The stick pusher inhibits this type of stall. At approximately one knot above stall speed, pre-programmed stick forces automatically move the stick forward, preventing the stall from developing. A G-limiter may also be incorporated into the system to prevent the pitch down generated by the stick pusher from imposing excessive loads on the aircraft. A “stick shaker,” on the other hand, provides stall warning when the airspeed is five to seven percent above stall speed. High altitudes—the higher an aircraft flies, the thinner the air and the greater the AOA required to produce the lift needed to maintain level flight. Heavy weights—the heavier the aircraft, the greater the lift required of the wing, and all other factors being equal, the greater the AOA. G loading—an increase in the G loading on the aircraft has the same effect as increasing the weight of the aircraft. Whether the increase in G forces is caused by turns, rough control usage, or turbulence, the effect of increasing the wing’s AOA is the same. On high-speed aircraft, flight controls are divided into primary flight controls and secondary or auxiliary flight controls. The primary flight controls maneuver the aircraft about the pitch, roll, and yaw axes. They include the ailerons, elevator, and rudder. 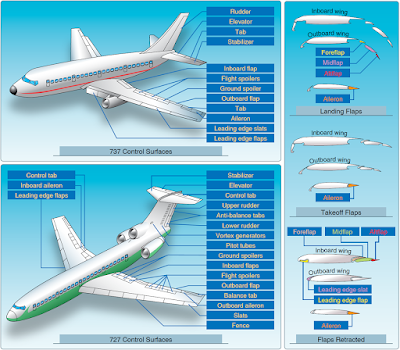 Secondary or auxiliary flight controls include tabs, leading edge flaps, trailing edge flaps, spoilers, and slats. Jet transport aircraft have small ailerons. The space for ailerons is limited because as much of the wing trailing edge as possible is needed for flaps. Also, a conventional size aileron would cause wing twist at high speed. For that reason, spoilers are used in unison with ailerons to provide additional roll control. Some jet transports have two sets of ailerons, a pair of outboard low-speed ailerons and a pair of high-speed inboard ailerons. When the flaps are fully retracted after takeoff, the outboard ailerons are automatically locked out in the faired position. When used for roll control, the spoiler on the side of the up-going aileron extends and reduces the lift on that side, causing the wing to drop. If the spoilers are extended as speed brakes, they can still be used for roll control. If they are the differential type, they extend further on one side and retract on the other side. If they are the non-differential type, they extend further on one side but do not retract on the other side. When fully extended as speed brakes, the non-differential spoilers remain extended and do not supplement the ailerons. To obtain a smooth stall and a higher AOA without airflow separation, the wing’s leading edge should have a wellrounded almost blunt shape that the airflow can adhere to at the higher AOA. With this shape, the airflow separation starts at the trailing edge and progresses forward gradually as AOA is increased. The pointed leading edge necessary for high-speed flight results in an abrupt stall and restricts the use of trailing edge flaps because the airflow cannot follow the sharp curve around the wing leading edge. The airflow tends to tear loose rather suddenly from the upper surface at a moderate AOA. To utilize trailing edge flaps, and thus increase the CL-MAX, the wing must go to a higher AOA without airflow separation. Therefore, leading edge slots, slats, and flaps are used to improve the low-speed characteristics during takeoff, climb, and landing. Although these devices are not as powerful as trailing edge flaps, they are effective when used full span in combination with high-lift trailing edge flaps. With the aid of these sophisticated high-lift devices, airflow separation is delayed and the CL-MAX is increased considerably. In fact, a 50 knot reduction in stall speed is not uncommon. These requirements are met by the use of a variable incidence horizontal stabilizer. Large trim changes on a fixed-tail aircraft require large elevator deflections. At these large deflections, little further elevator movement remains in the same direction. A variable incidence horizontal stabilizer is designed to take out the trim changes. The stabilizer is larger than the elevator, and consequently does not need to be moved through as large an angle. This leaves the elevator streamlining the tail plane with a full range of movement up and down. The variable incidence horizontal stabilizer can be set to handle the bulk of the pitch control demand, with the elevator handling the rest. On aircraft equipped with a variable incidence horizontal stabilizer, the elevator is smaller and less effective in isolation than it is on a fixed-tail aircraft. In comparison to other flight controls, the variable incidence horizontal stabilizer is enormously powerful in its effect. Because of the size and high speeds of jet transport aircraft, the forces required to move the control surfaces can be beyond the strength of the pilot. Consequently, the control surfaces are actuated by hydraulic or electrical power units. Moving the controls in the flight deck signals the control angle required, and the power unit positions the actual control surface. In the event of complete power unit failure, movement of the control surface can be affected by manually controlling the control tabs. Moving the control tab upsets the aerodynamic balance, which causes the control surface to move.